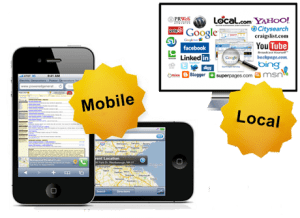 Local Mobile Marketing – Why? Nowadays, your customers are taking their internet connection with them everywhere they go. Mobile marketing and mobile websites are growing in popularity so quickly, most business owners are struggling to keep up! Get that extra edge over your competition by being the first one to utilize mobile marketing to your advantage. Contact us today for a free consultation and quote on how we can help your business profit from the mobile marketing madness. 82% of all Americans never leave home without their mobile phone. Half of all Americans sleep with their mobile phone. More than four in 10 Americans say they “can’t live” without their mobile phone. 79% of smartphone users would ﬁnd it useful to download money-off coupons to their phones. 73% of smartphone users would receive instant money-off coupons as they pass by an item in a store. According to consumer research by The MMA and Lightspeed Research (Sept. 2012), in UK, France and Germany, 45 percent of consumers (especially younger people) noticed mobile advertising and of these, 29 percent responded to it. Of those that responded to the ads, in Germany 49 percent, UK 47 percent and in France 22 percent went on to make a purchase. There is growing demand for access to online products and services that can be taken in your pocket. We can help you get onboard and stay current with the latest in mobile technology. Mobile marketing allows you to send specials, limited offer deals and promotions straight to your customers’ phones or mobile devices. You can offer them daily deals that they can take advantage of on the road, at the coffee shop, or anywhere else they are. The great challenge of mobile marketing is to say what you have to say fast. You need a headline that will catch their attention and you’ve got to make your offer in 160 characters or less. Our mobile marketing experts are pros at crafting the right wording to get them clicking. Mobile websites and mobile search engine optimization are also becoming essential for every online business. Because we understand mobile, we can get your site everywhere it needs to be so that your target market can view it when they’re on the move.